There is ample parking at all our trailheads to head out from for hiking and backpacking on the Pine Mountain Trail. 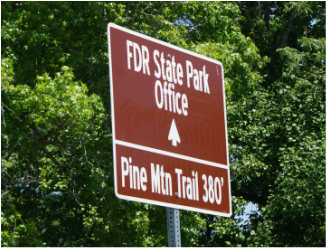 If you look at the Pine Mountain Trail map, you will see five named off road parking areas along GA 190 besides the FDR Park Office Parking area (Gardens Overlook, Buzzards Roost, Fox Den Cove, Mollyhugger Hill and Rocky Point) which are located at trail road crossings. Trail access and parking can also be found at Dowdell Knob Trailhead Parking Area and the BootTop Trail Parking Area at the road crossing of the BootTop Trail on Dowdell Knob Road, WJSP-TV Tower Parking Area and trailhead/picnic area (end of the trail at Mile 23 off Alt 85), FDR State Park Swimming Pool parking lot for the Pool Trail (on GA 354), and "No Name" Parking Lot for the Pine Mountain Trail and Mountain Creek Trail (off Lake Delano Road). "No Name" Parking Lot is gravel (the only non-paved parking area). To hike the Mountain Creek Trail, you can park in the paved parking area in front of the FDR RV Campground Trading Post. Near the western end of the trail, parking is available at the Country Store parking lot at US 27 and Ga 190 just outside FDR State Park. The Country Store parking area is the only free parking area. If you park at the Country Store Parking Lot and wonder how far it is to the trail and where the trail is, here is your sign!